After touring with pop punk outfit Never Young, Nikolas Soelter decided he wanted to make more music, but on his own terms this time. 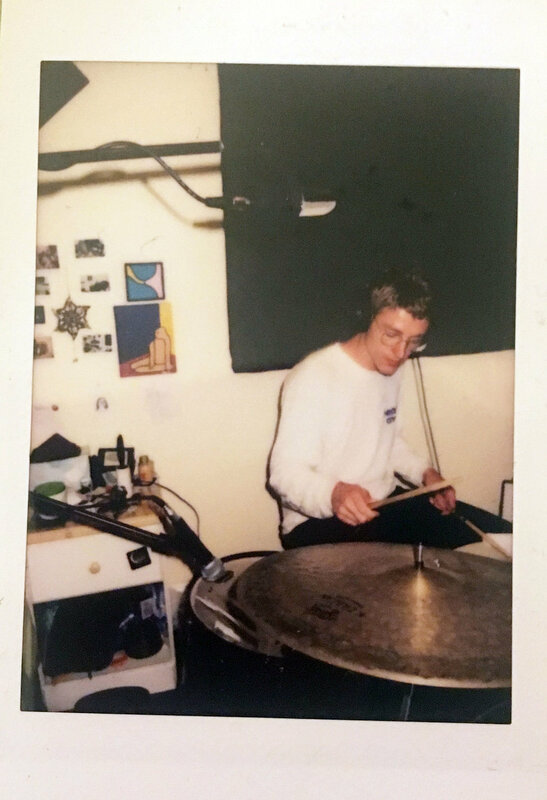 This lead to Soelter collaborating with Melina Duterte of Jay Som to write and record what would be his first EP, Angel of Doubt, under the solo artist name Nylon Smile. Melted got in touch with Soelter to talk about Nylon Smile, the work that went into making Angel of Doubt and the EP’s distinct sounds. WHAT WERE SOME SOURCES OF INSPIRATION WHILE WORKING ON ANGEL OF DOUBT? I had just been on a really tough tour with my band at the time, and had come back from it wanting to make more personal music, and literally just quieter music. I think at the time I was writing these songs (Spring 2017), I was listening to the Big Thief and Alex G records that had just come out. My friend Mark also used to [be in] this band called CDXX that I loved when I was in highschool, and found myself going back to that a lot. NYLON SMILE DOESN’T HAVE A SOCIAL MEDIA PRESENCE. IN AN ERA IN WHICH ONLINE INTERACTION AND PRESENCE IS AN EXPECTATION, WHAT IS YOUR APPROACH TO STAYING CONNECTED WITH FANS AND GETTING YOUR MUSIC OUT THERE? When I was putting these songs out I was mostly interested in sharing them with people I already knew, so doing everything through my personal pages felt right. Because I'm releasing the music as myself and not a group of people doing a band, it feels funny to have a page for it, when everyone who would listen is already connected to me through some page. I did just play my first show with a real band (shout out to Martin, Taylor and Oliver), and people were asking about an instagram, so maybe I'll make one now! HOW DID YOU GET CONNECTED WITH MANNY OF CITRUS CITY RECORDS AND WHAT LEAD TO THAT RELEASE? I was playing in a band called Never Young for a couple of years with my friend Niko and while we were in that band together he put out a record with Manny, which first got me interested in Citrus City. Then I discovered Crumb, another amazing artist on Manny's label, and it cemented CC in my mind as having this awesome roster and putting out great music. Niko spoke highly of Manny and I could tell from the CC twitter account that Manny and I both came to music from a very DIY approach and were into similar things, so I emailed him asking if he'd be into putting out my music! Manny rules, and I feel very lucky that this is out on Citrus City. WHAT WAS WORKING WITH MELINA DUTERTE OF JAY SOM LIKE? WHAT WAS IT ABOUT HER PRODUCTION STYLE THAT YOU LIKE AND FEELS LIKE A FIT TO THE SOUND YOU’RE AIMING FOR? Melina was running a little studio out of her place in Oakland and had just recorded a batch of songs for a friend of mine and I thought they sounded incredible, not to mention all of her records sound amazing and she handles everything on those. Recording was super easy and was basically just hanging out and trying different things. We recorded this broken piano at her house and then autotuned it to match the song, which gave the piano this really crazy quality. I think compared to a lot of other people who record in their bedrooms, Melina is able to get really full sounding recordings, but still find space for every sound. She's also a master of creating glitchy, pitched up effects. THE PRODUCTION OF “YOUNGER” GIVES OFF AN ALMOST DEMONIC SOUND THAT CONTRASTS THE GENERAL BEDROOM POP/SLACKER FEEL OF THE REST OF THE SONGS. WHAT WAS THE PROCESS OF WRITING + RECORDING THIS TRACK + WHAT LED TO THIS VERY SIGNIFICANT SOUND FOR THE FINAL VERSION? This song was supposed to be a really slow ballad, but I ended up recording it too fast, so we slowed it down in Logic, but did it the same way a tape machine would, with the pitch lowering as well, and thought it sounded awesome. After we tried that we slowed down “Dust” a bit too, so it's actually a half-step lower than how it was recorded. I think pitch shifting recordings even slightly can really give you a new perspective on a song and gives everything this really pretty blurred effect. I thought it would be a cool way to end the EP and leave things open-ended as to what future Nylon Smile songs could sound like. WHAT IS THE SIGNIFICANCE OF THE TITLE TRACK? WHAT ARE SONG ANGELS OF DOUBT IN YOUR LIFE + HOW DO YOU COMBAT THEM? The title of that first song ended up working as the title for the whole EP because lyrically all the songs deal with uncertainty and confusion. I think that any touring musician will tell you that being on tour for any significant amount of time can be really isolating, and I think my experience on that tour I had just been on left me questioning a lot of things. Since then I've put a lot of changes into motion in my life, got back into going to therapy, investing time into having a more diverse life, oh and I got a cat, shout out to Loti, she is an angel.